Harry S. Truman was the president of the United States from 1945 to 1953. In the 31st century, he resides at the Head Museum, New New York along with the other former U.S. presidents. On 9 July, 1947 the time travelling Planet Express ship crashed in Roswell, New Mexico. 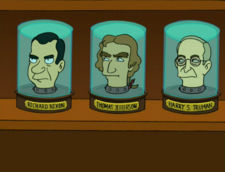 Dr. Zoidberg was captured and questioned by Truman himself who arrived in Roswell as soon as he heard what had happened. When the Planet Express crew stole the microwave dish and rescued Bender and Dr. Zoidberg, Fry threw Dr. Zoidberg's organs at Truman. Harry S. Truman in 1947. Maurice LaMarche studied tapes of Truman to get the voice right. Truman: If you're here to make peace, surrender or be destroyed. If you're here to make war, we surrender. Dr. Zoidberg: Both good. The important thing is I'm meeting new people. Truman: Bushwah! Now what's your mission? Are you planning to make some kind of alien-human hybrid? Zoidberg: Are you coming onto me? Truman: Hot crackers, I take exception to that! Zoidberg: (sexfully) I'm not hearing a no. Truman: Whistling Dixie! I want this sent to Area 51 for study. General: But, sir, that's where we're building the fake moon-landing set. Truman: Then we'll have to really land on the moon. Invent NASA and tell them to get off their fannies! This page was last edited on 15 May 2012, at 17:47.